With all the snow we’ve had this season I’m amazed that the mail service and UPS can keep deliveries on schedule, but they do. I received three print books and one audiobook last week. I try to keep the snow cleared from my walkways but I’m running out of places to put it. A bright spot in this dreary winter has a been a family of cardinals that have taken a liking to my backyard, although I’m sure the safflower seed and heated water keep them happy. The Remedy by Thomas Goetz from Gotham Books. Notorious by Allison Brennan from Minotaur Books. A nationally renowned investigative reporter with her own TV show and a tough-as-nails reputation, Maxine Revere tackles cold cases from across the country and every walk of life. But the one unsolved murder that still haunts her is a case from her own past. The Book of You by Claire Kendal from Harper. A mesmerizing tale of psychological suspense about a woman who must fight to escape an expert manipulator determined to possess her, Claire Kendal’s debut novel is a sophisticated and disturbing portrait of compulsion, control, and terror. 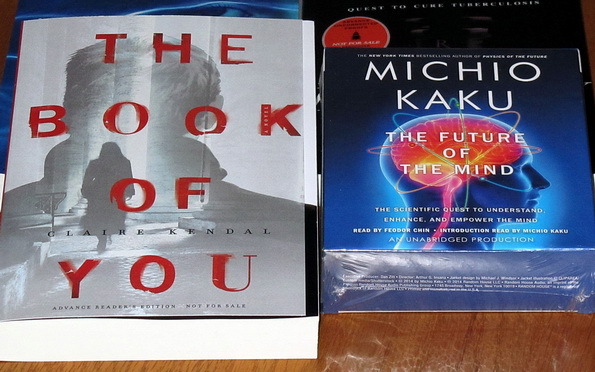 The Future of the Mind by Michio Kaku from Random House Audio. The Future of the Mind gives us an authoritative and compelling look at the astonishing research being done in top laboratories around the world—all based on the latest advancements in neuroscience and physics. Enjoy all these books…lots of psychological ones in there. Yeah, they are. I think the winter is having an effect on my mental state! You got some fascinating looking books. The Remedy stands out to me. Great mailbox! Hope you enjoy your new books! 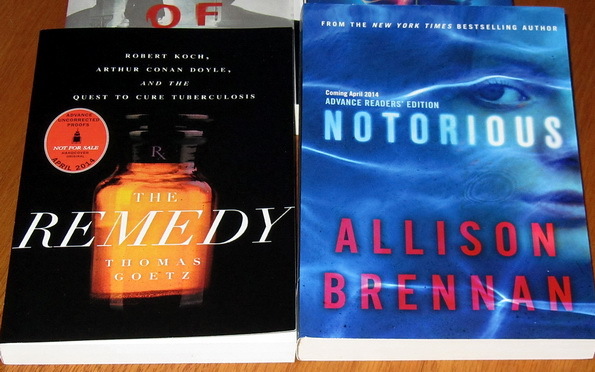 Notorious and The Book of You sound like my kind of reads! Enjoy…and thanks for sharing. Oh my goodness…I’m sure I’d love any one of these. I’m reading, Sharp Objects. The Book of You sounds interesting – I’ll watch for your review! My mail carrier is a high school friend as well as a fellow reader. She loves to find out what books I received! The Allison Brennan is one I’ll be looking forward to. ENJOY your books. THE REMEDY looks good. We are also running out of place to put the snow! And more is on the way… oh joy! Oh wow, The Remedy sounds great – I know a lot of people who would like this! (That sounds incredibly nerdy!) Thanks for bringing it to my attention, happy reading and send some cold Down Under please! They all look good, Leslie. The sorts of books I’d love to read if I had the time. They all look good, but I love cold cases!